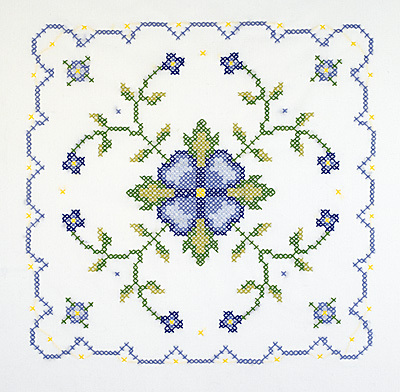 Blue & Yellow Floral Quilt Blocks Stitch and sew a decorative throw or an heirloom quilt with these lovely blocks of stamped flowers, vines and leaves. Assemble these broadcloth squares yourself with floss colors and finishing fabric of your choice. May be accented with our Blue & Yellow Floral pillowcase pair. Kit contains: 6 screen- printed 18"x 18" 50/50 polyester/ cotton broadcloth blocks, needle, graph, and instructions. Don't forget the Quilt Batting! 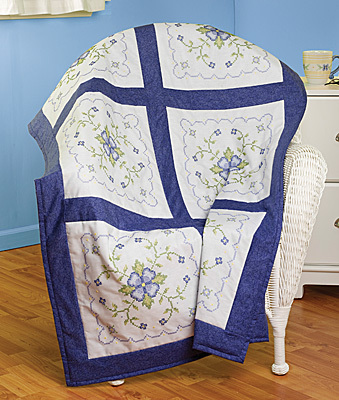 Click here to see our Quilt Batting selection on Janlynn.com.